Il Poggio-'the ledge'-is your private window on some of Umbria's prettiest scenery, and a perfect base for the nearby tourist centres of Perugia, Assisi, Spoleto as well as Todi-which is in full view. The farmhouse sits in 2 hectares of gently sloping fields bordered with olives and oak trees. It is built in the traditional stone, timber and terracotta, but with 21st century kitchen, bathrooms, heating and lighting. It has a completely private, zero-chlorine 12 meter 'infinity' pool with panoramic views, poolhouse and a new (2007) tennis court below. The main house makes the most of the views and summer breezes, with its wide covered porches, spacious open-plan living area and separate study downstairs plus three bedrooms upstairs. There are pinewoods with walking trails directly behind the house. A 1km gravel drive leads out to the main asphalt road to the hamlet of Saragano. Shopping and restaurants are at 5 km and the famous wineries and sights of Montefalco and Bevagna at 10km. We are semi-retired Umbria enthusiasts. Andrea (Andrew) is half Italian, a research economist, and Carole, 100% English, a dyslexia tutor. We rent the house only for limited periods, spending as much time there with friends and family as we can. 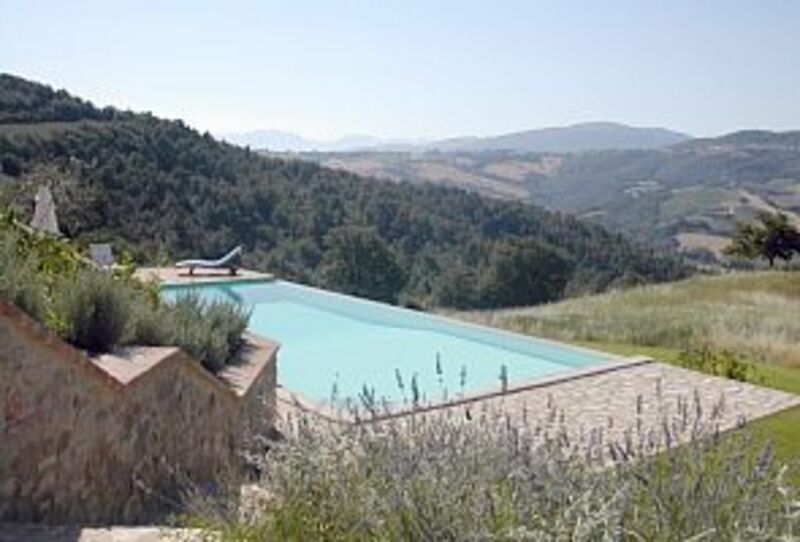 Fantastic views, a great feeling of space and quiet, and the best pool... Andrea has been coming to Umbria for four decades before we developed this site. It has a lot of memories for us, and a lot of our personal art and decoration. Purpose-designed to get the most out of the 360 degree views (and breezes) and the infinity pool, the tennis court and ample terraces. Modern lighting, kitchen and bathroom systems in a traditional farmhouse shell. Fast satellite wi-fi for those, like us, who choose to do a bit of work, or just network, between sunbathes. There is also an outdoor shower poolside. Covered terraces on two sides provide shade from all exposures. Ground floor and terraces easily accessible but upstairs and pool area not. I keep on coming back to Il Poggio because it's the complete package; beautiful, secluded and spacious with the most incredible pool. You never tire of the view, or the scent of the lavender that surrounds the house. A fantastic villa with views to die for! Il Poggio was exactly what we wanted for a relaxing week away. Lovely pool and amazing house - we would definitely recommend. House is at 400m across valley, 20km from Todi. Todi lies midway between Perugia with its National Gallery (airport 30min, served by Ryanair) and Orvieto with its Cathedral on the A1 Rome-Florence motorway (Rome airports about 2 hours, Ciampino closer than Fiumincino). The E45 expressway, 15 mins from house , connects with the famous art, religious sites and and architecture of Todi, Perugia, Assisi, Foligno and Spoleto going clockwise, the Perugia- Arezzo-Florence motorway around Lake Trasimeno (45 mins) (beaches, islands, Hannibal battle site) anticlockwise, and continues to northern Umbria and the Marche (Gubbio, Urbino, Ancona) . Quiet roads inside E45 arc connect wineries and tourist spots of Bevagna, Montefalco, Spello, Trevi easily within 30 mins. Scenic walks in national and regional parks of Monti Martani (30 mins), Subasio above Assisi,(45 mins) and beyond Spoleto, the Sibillini range with skiing resorts (60-90 mins). Also easy walks around house in local forest reserve. Rent is for up to six persons, inclusive of bedlinen and towels, maid service at end of each week of rental, and all utilities except central heating. Two additional children can be accommodated at owners' discretion. Discounts of 10% for stays of two weeks or more in low and mid season, and 5% for early bookings (deposit received by 31 January, 2018). Infinity pool is open during mid and high seasons (2 June through 7 September) for exclusive use of house guests. Renters wanting to use the pool after the normal closing date (8 September) will be charged an additional 300 Euro per week.